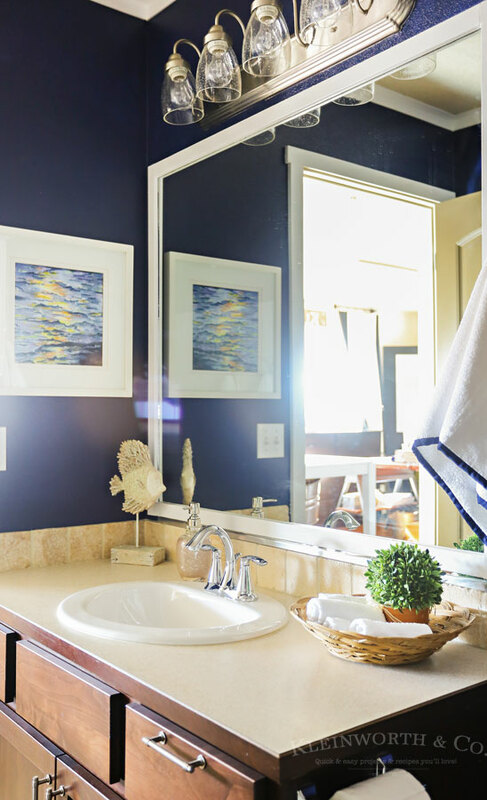 This Nautical Navy & White Bathroom Makeover takes a boring, builder grade bathroom & transforms it into a beautiful space. Start to finish in just 2 days. 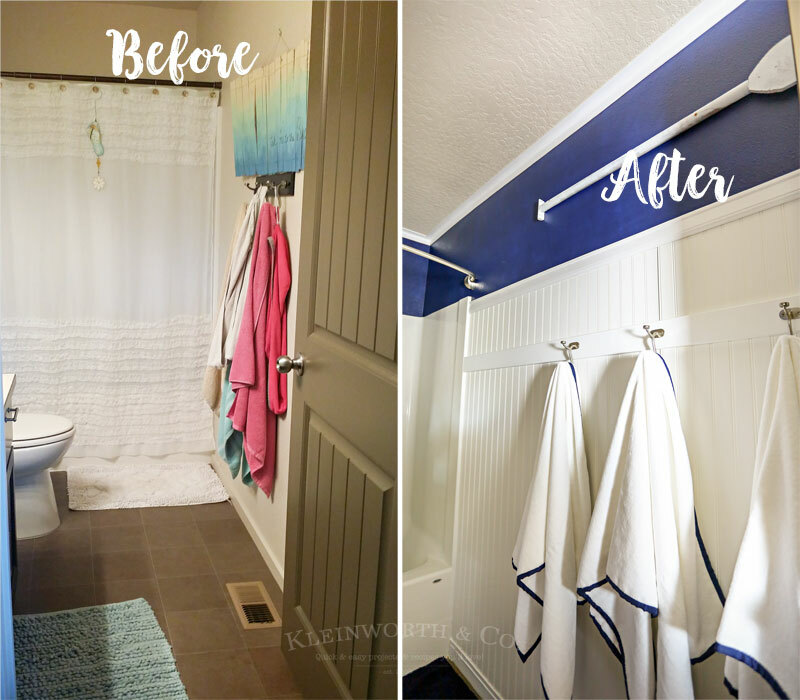 A few weeks ago we jumped into to a sort of spur of the moment weekend bathroom makeover. You see, we were preparing to leave the following weekend for our 11-day trek home to So Cal & back. But I needed to get it done & wrapped up because I knew my week leading up to our trip would be quite full with getting things scheduled. 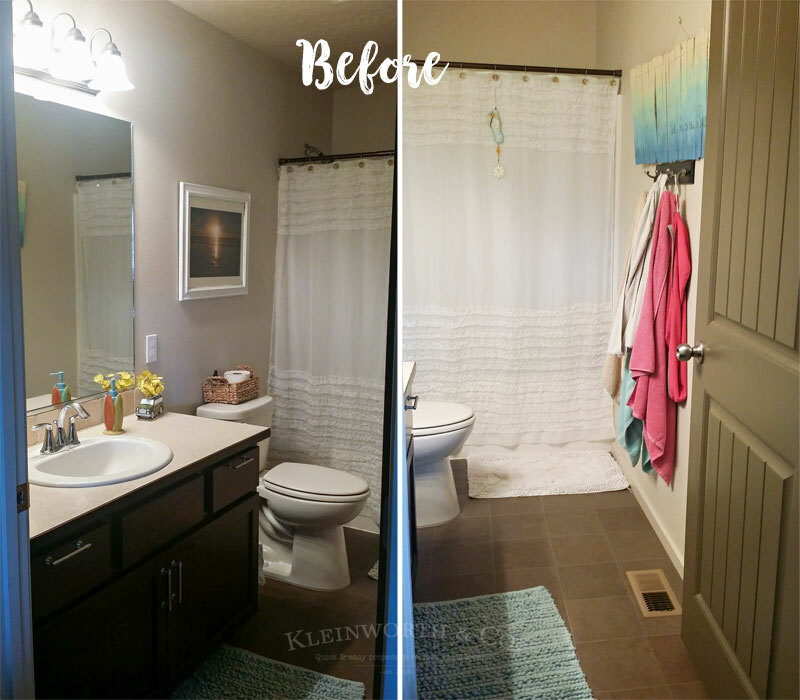 But we are getting so close to the holidays & I really wanted to get that bathroom transformed from the boring, blah, builder grade that we had been living with since we moved in 2 years ago. This is the bathroom that guests will use & I didn’t want it to look like a neglected kids bathroom. I wanted bold style that fits who we are. 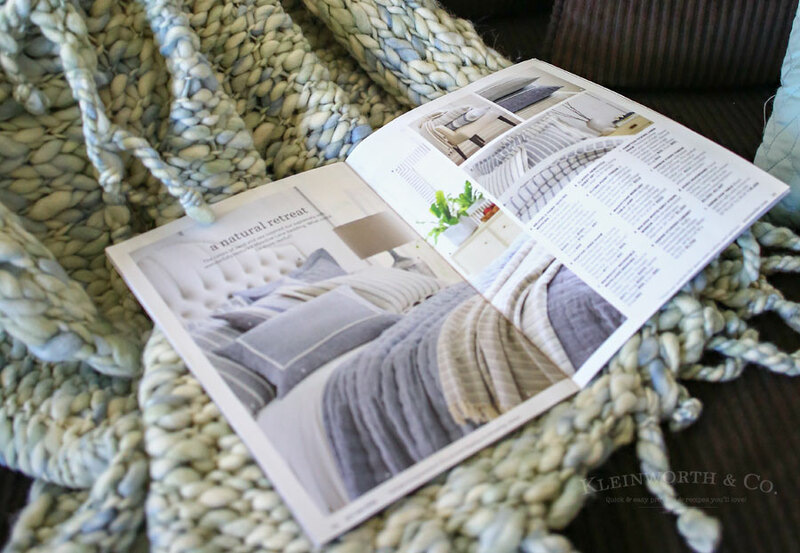 First thing I did was browse the Annie Selke catalog for inspiration. There was a lot of coastal tones found throughout & I was inspired to kick up our beach vibe to a new level with this room makeover. I was leaning towards mint & white, since that is my usual color combination preference. 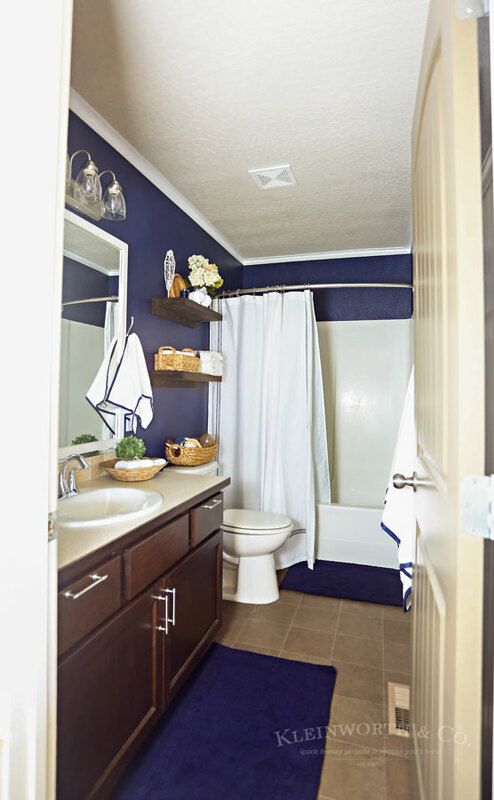 But then the hubs took a look & said he liked the indigo. That’s when it hit me & the vision all came together. I was excited to place my order & get started. Let’s be clear here. This is what the room looked like before. Our builder painted walls, ceiling & trim all the same shade of cream. It has no definition & the whole room was as boring as the color on the walls. It was depressing & I was ready for a change. We first painted the walls. I have to say, the whole family was totally freaked out when I put that first coat of indigo on the walls. But I was not worried. I could already see this idea coming to life & I was thrilled about it. Then we added beadboard & trim to the other wall to be the same height as the shower & added a hook rail & hooks. We built & stained some shelves for above the toilet & framed out the mirror. That was the extent of the DIY. The rest came in the decorating. 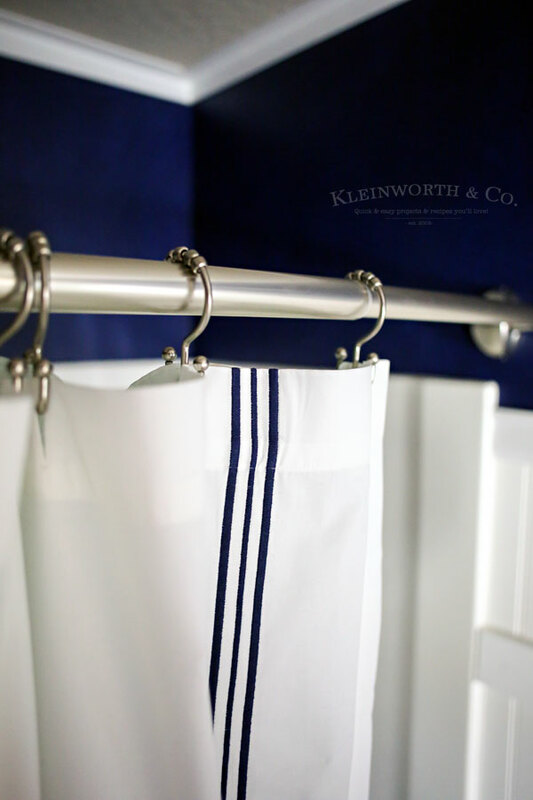 We decided to install a curved shower curtain rod to give the kids & guests more space in that small area. It makes a world of difference. 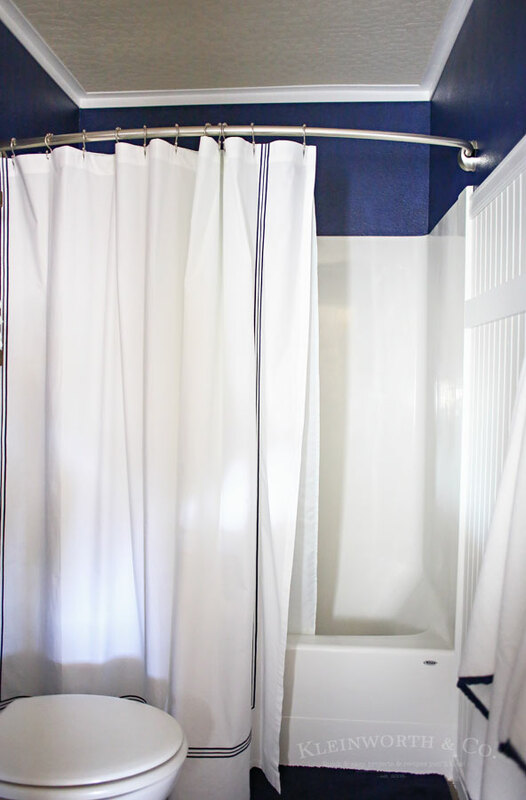 Plus it really helps to highlight this GORGEOUS shower curtain from Annie Selke. These towels, ahhhhh these towels. They are the most luxurious, beautiful towels ever! I have the 3 bath towels on the hooks & then this hand towel hangs here near the sink. I love them!!! Really makes the space feel spa like. 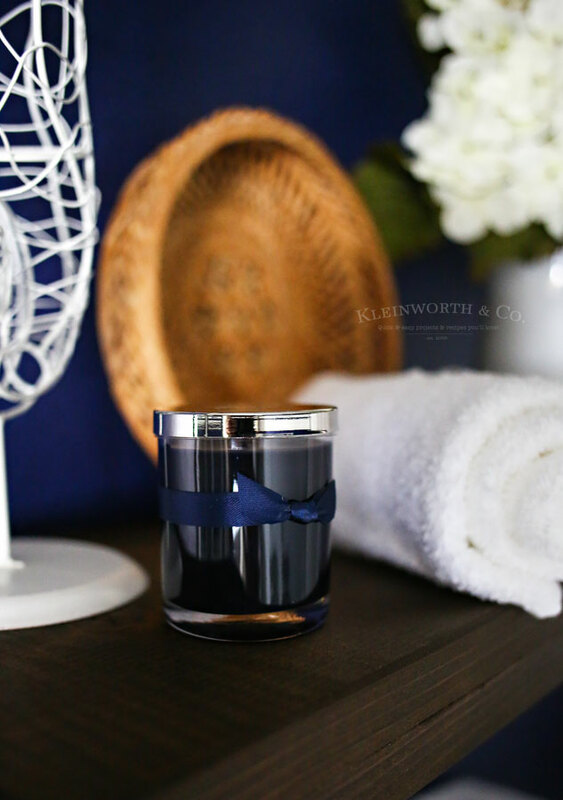 When decorating the shelves I made sure to include this beautiful little navy candle that fit the space perfectly. Eventually we will change out the entire light fixture in here. But we had hit our budget (in time & money) for this project by the end of the weekend. So we changed out the shades instead with this clear seeded glass. 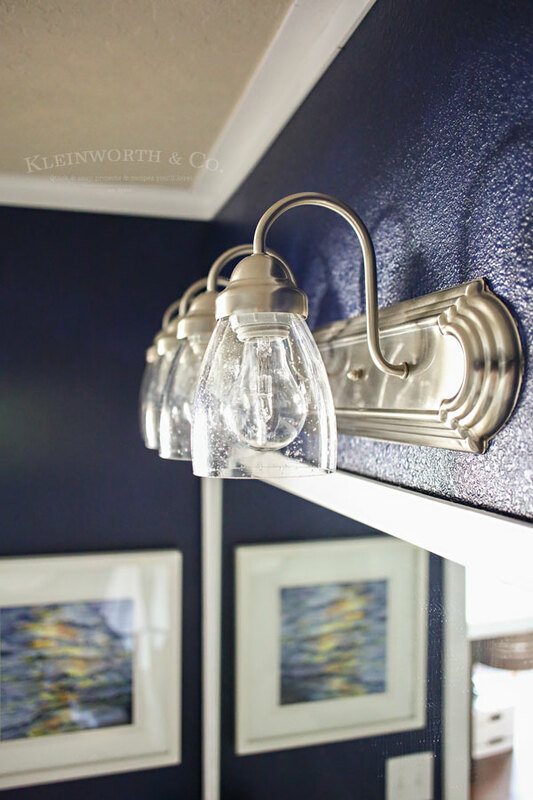 It’s amazing how $20 in shades can change the whole look of the room & fixture too. 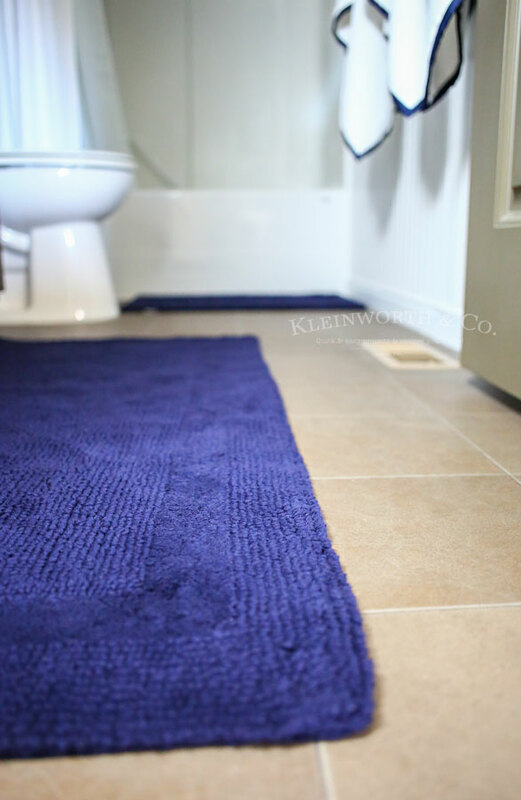 We added these incredibly plush rugs in front of the sink & shower. 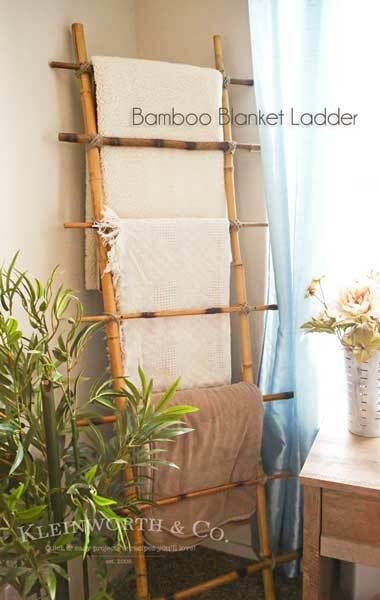 The kids say it’s so luzurious to step out on these cozy rugs after their showers. Oh I almost forgot- that wasn’t the end of the DIY. At the last minute we decided to take a little extra trim & do some crown molding. I decided to leave the ceiling the original color for some depth. I have to say- I’m just swooning over this space. 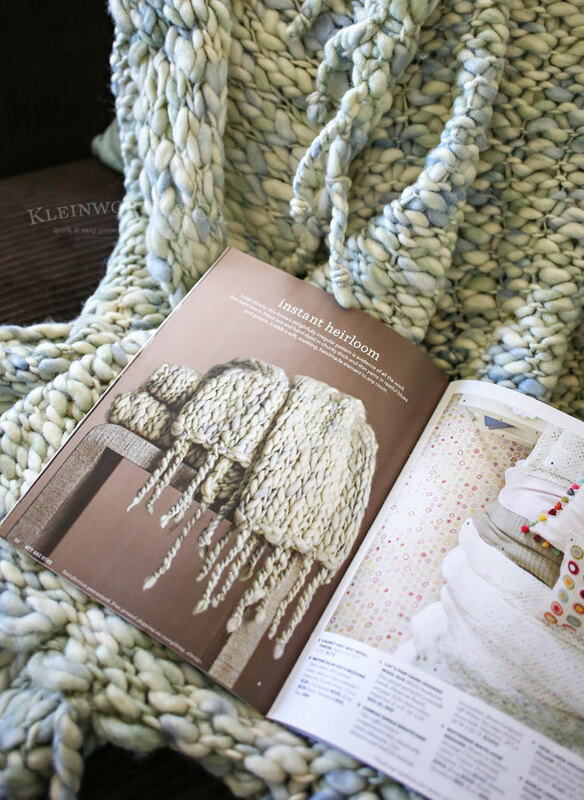 When we were done, I curled up on the couch with this INCREDIBLE throw, also from Annie Selke. When I saw it, I knew I had to have it. 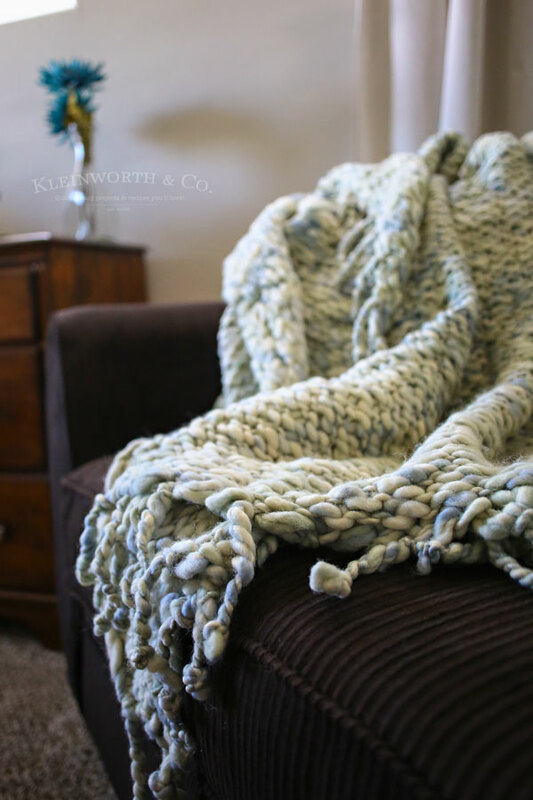 I love chunky knit & with our super cold winters here in North Idaho, this blanket will be my new best friend. 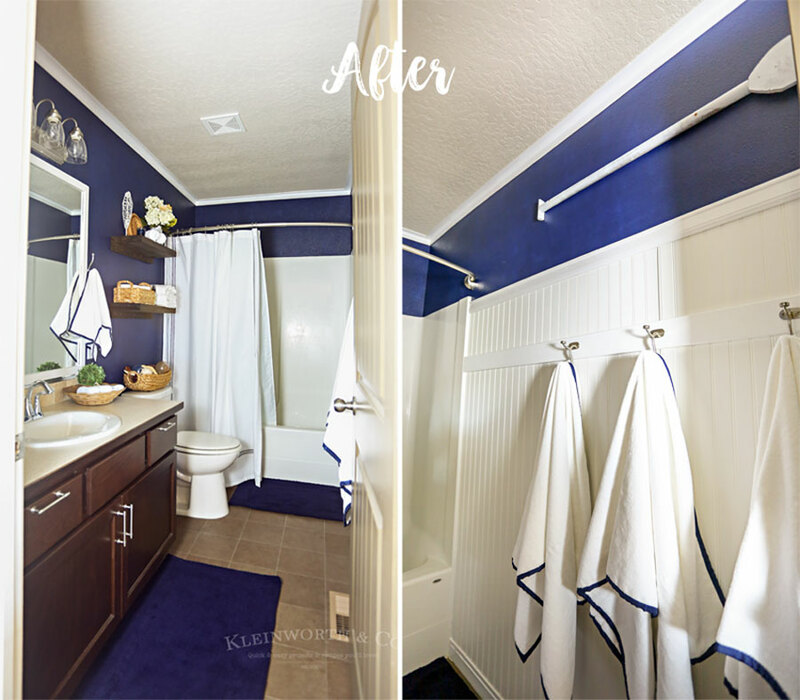 So – let’s take a look at the before & afters one more time! My son actually built that paddle out of scrap wood & part of a closet pole. 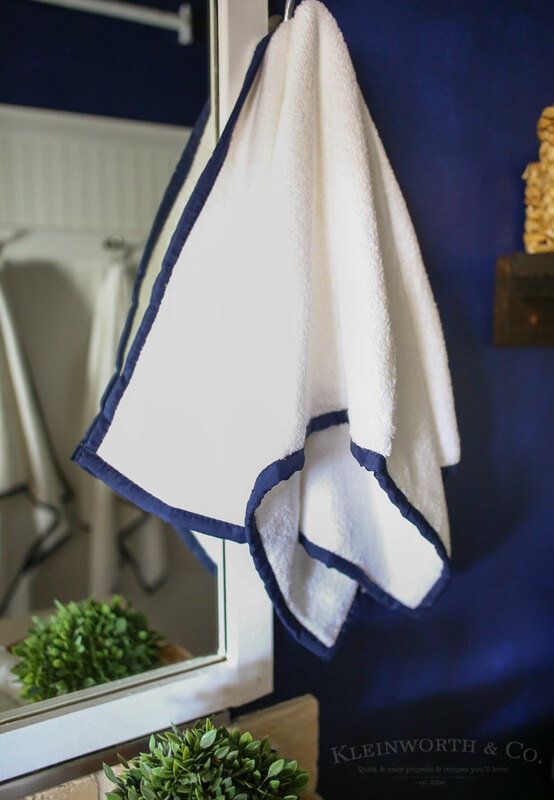 I loved it so much & it was perfect for this Nautical Navy & White Bathroom Makeover. 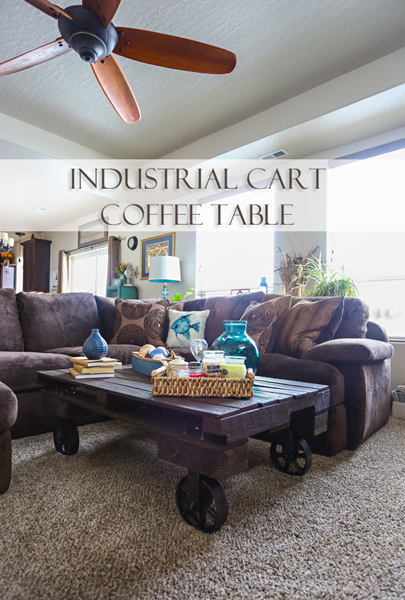 If you are passionate about style, comfort & quality like I am – Annie Selke is your place for home decor. To find out more visit Annie Selke: website, Newsletter, Instagram @annieselke, Facebook @annieselke, Twitter @annieselkeco & Pinterest. 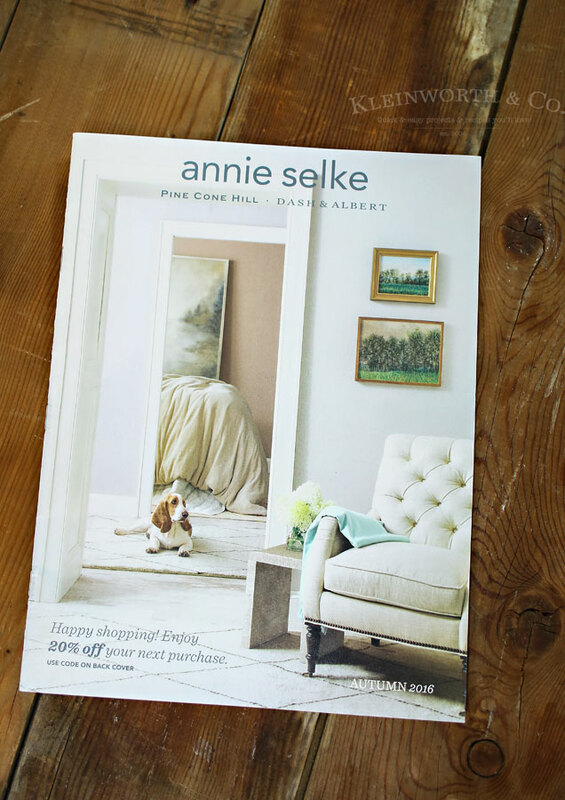 Sign up for the Annie Selke email newsletter and receive 15% off of your first order! 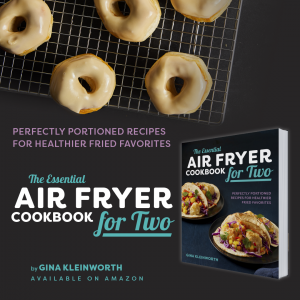 Don’t miss this FABULOUS GIVEAWY!!!!!!!! • Prize: One of 3 Annie Selke gift cards, each valued at $500!!!!!! I’m so in love with this space! I can’t believe we put it together in just a weekend! 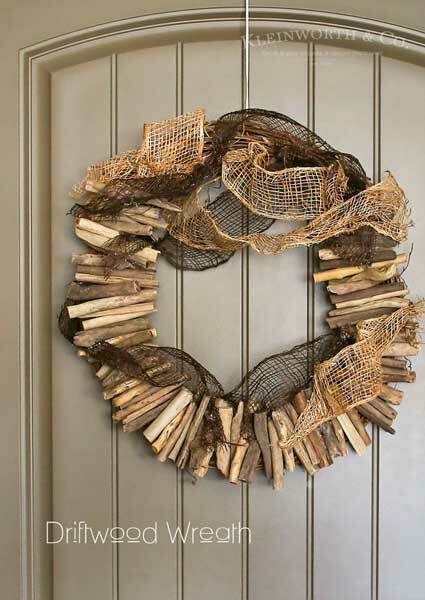 Looking for more home decorating ideas? Great idea for the colour and job well done! Thanks for the opportunity to win. Love it!! the color is fantastic!! I really like the bathroom makeover! Have a great day! 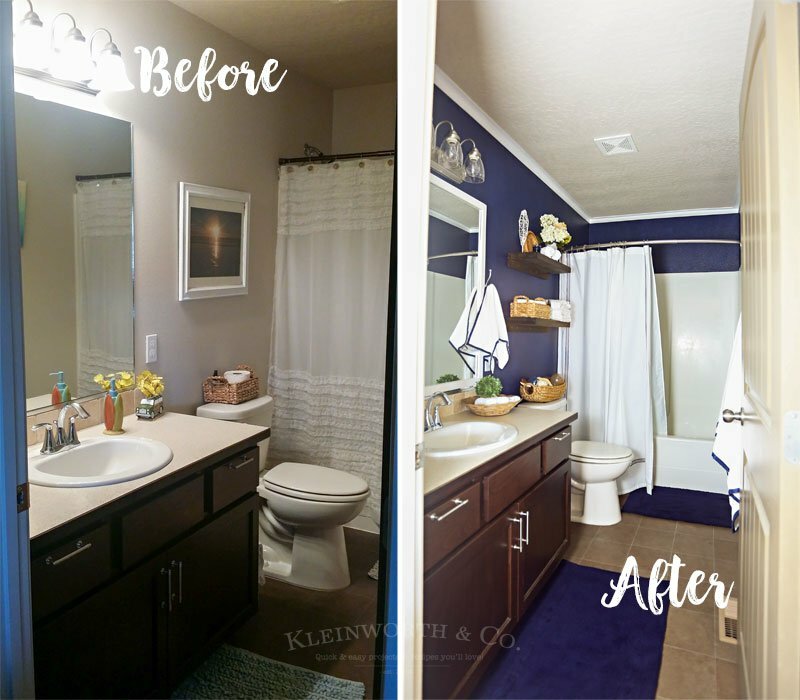 I adore seeing makeovers in a home! Favorite pastime of mine! Great color!!!!!! Oh my word! What a wonderful make-over! I can imagine the kids are just tickled pink to use that bath now! Absolutely beautiful! The bathroom looks great! I love the nautical style. Hope you have a great week!